Whatever Happened to Hitler's Body? 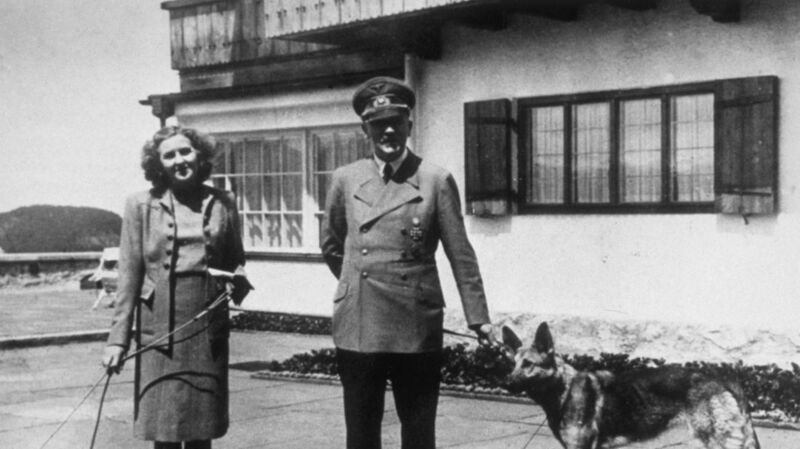 In the early morning hours of April 29, 1945, Adolf Hitler married his longtime girlfriend Eva Braun in the map room of his underground bunker in Berlin. Municipal councilor Walter Wagner performed the ceremony, and Minister of Propaganda Josef Göebbels and the Chancellor’s private secretary, Martin Bormann, acted as witnesses. After the ceremony, Hitler hosted a small reception breakfast with his new wife and then, at around 4 am, took secretary Traudl Junge to another room and dictated his Last Will and Testament. The next day, as the Red Army marched into the German capital, General Helmuth Weidling, commander of the Berlin Defence Area, told Hitler that defense forces would probably run out of ammunition by the end of the night. After lunch, Hitler and Braun said their goodbyes to the other high-ranking Nazi officials occupying the Führerbunker, as well as the bunker’s staff. At around 2:30, the couple went into Hitler’s study and closed the door. An hour later, a gunshot was heard. Bormann and the others rushed to the study and found Hitler and Braun’s lifeless bodies slumped on a small sofa. Hitler’s right temple was dripping blood and his pistol lay at his feet. Braun had no visible wounds, but the room smelled distinctly of almonds, a sign of cyanide poisoning. The bodies were carried upstairs and outside through the bunker's emergency exit. In the bombed-out garden behind the Reich Chancellery, the soldiers wrapped their Führer in a Nazi flag, doused the bodies with gasoline and set them on fire. The bodies burned through the afternoon, as the Soviets occasionally shelled the area. Even though the bodies weren’t completely destroyed, the fire was eventually extinguished in the early evening. The remains were dumped in a shallow shell crater and covered up. On the morning of May 2, Ivan Churakov, a private in the Soviet Army, noticed an oblong patch of recently turned soil as he and the 79th Rifle Corps searched the Chancellery. He began to dig, thinking he might uncover some hastily buried Nazi treasure. Instead, his shovel hit bone. “Comrade Lieutenant Colonel, there are legs here,” he called to his commanding officer. An exhumation was ordered and the soldiers dug up the bodies of two dogs (thought to be Blondi, Hitler’s pet German Shepherd, and one of her pups) and the badly burnt remains of two people. An autopsy was performed, and a few days later, Soviet soldiers moved Hitler’s body to a different gravesite outside of Berlin proper. This would be just one of several moves the corpse would make in the next few decades. In early June that year, the Soviets re-buried the body in a forest near the town of Rathenau. Eight months later, they moved it again—this time, to the Soviet Army garrison in Magdeburg. There it remained until March 1970, when the Soviets decided to abandon the garrison and turn it over to the East German civilian government. Andropov selected a KGB officer named Vladimir Gumenyuk to pick a secret final resting place for Hitler’s remains and lead a three-man team in taking the remains there for destruction. The Soviet garrison was surrounded by German-built high-rise buildings, so Gumenyuk’s team pitched a tent over the spot where the bones had been buried to avoid being seen. After some digging with no results, the team realized they had counted 45 meters instead of 45 paces from a secret coordinate while following the directions to the corpse. They put the dirt back, moved the tent, and started again. With the remains in their possession, the team disguised themselves as fishermen and drove into the mountains, stopping at a cliff along a small stream. There, in a spot screened by trees, they lit two campfires. One was to make soup. The other, to further burn the remains. Gumenyuk has called the second cremation a waste of a can of gasoline, but the remains were finally burned to ashes. They collected these in a rucksack, which Gumenyuk took onto the cliff and opened up into the wind. With that, one of history’s greatest monsters disappeared, a brown cloud of dust in the wind.